The artistic identity of Antonio Amorosi was rediscovered by Roberto Longhi in an article published in 1938 in which he separated the work of this artist from that of the Danish painter Bernhard Keil (1624–1687), to whom most of Amorosi’s works were previously attributed. 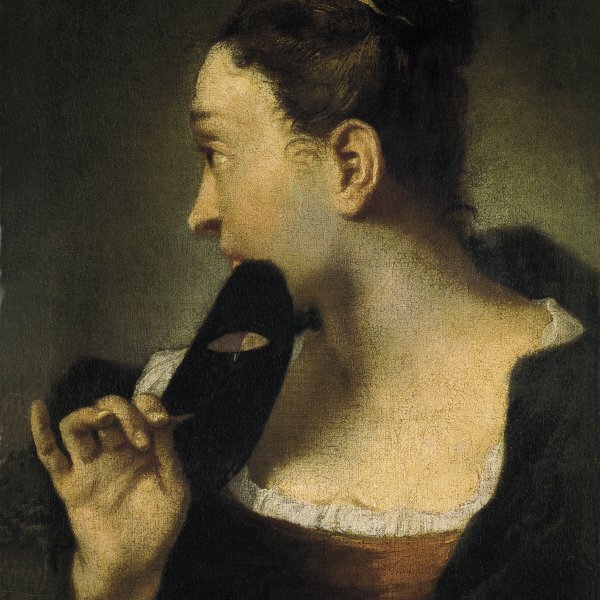 Other studies on the artist followed Longhi’s text, including those by Eugenio Battisti, Ana Maria Rybko and the monograph by Claudio Maggini. In addition to investigating the artist’s life, these texts partly reconstructed his oeuvre, an issue that remains to be fully resolved. Antonio Amorosi trained in Rome in the studio of Giuseppe Ghezzi (1634–1721), where he remained for eleven years from 1676 to 1687.While he also produced religious compositions, of which there are some surviving examples in Civitavecchia and Rome, Amorosi was primarily a genre painter, the field in which he was most celebrated and in which he produced his finest works. His earliest known work is a portrait of a boy of around 1690, in a private New York collection. The present work clearly falls within the category of a genre painting, and is considered one of Amorosi’s best compositions of this type. The girl is depicted half-length and is illuminated from the right. 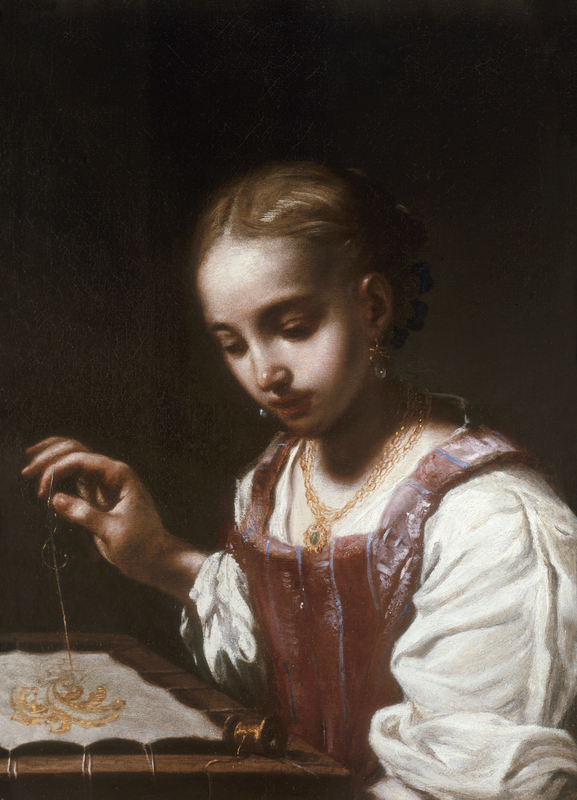 With her gaze lowered, she concentrates on her sewing, her face and neck illuminated through soft contrasts while her body is more uniformly lit. The artist opted for a black background from which the form of this diligent young woman emerges in a striking and effective manner. The composition includes a number of elements that Maggini considered to be typical of Amorosi, including the realistic treatment of the face, which is softened with a delicate elegance and painted with a loose type of brushstroke. Amorosi frequently painted children involved in everyday activities in works that convey an idyllic mood despite the various tasks in which they are engaged. He may have been inspired by compositions of this type by the bamboccianti as well as more directly by contemporary paintings by Donati Creti (1671–1749) and Bernhard Keil, as Contini noted. The present canvas seems to form a pair with the Tapestry-seller in the collection of the Thyssen-Bornemisza Heirs. It is stylistically and compositionally similar and deploys the same manner of constructing the face and figure, although the boy is illuminated by a stronger shaft of light. In addition, the Nationalmuseet in Stockholm has a portrait of a girl that is similar to the present work. The canvas entered the Collection in 1979 from a private UK collection.